Rebel forces have uploaded hours of video footage on to YouTube to condemn human rights abuses in Syria and document defections. When a selection of Bashar and Asthma al-Assad’s emails were hacked, then leaked, in 2012 we regarded them in awe. The democracy activists’ choice to reveal the Assads’ luxury shopping list exposed their extreme consumption and, as is always the case for the international millionaire, the couple’s immunity to international sanctions. The leaks revealed not only the activists’ wit but also new forms of political resistance in a digital era. The Syrian online activist scene has offered some of the most creative, persistent and effective ways to protest. 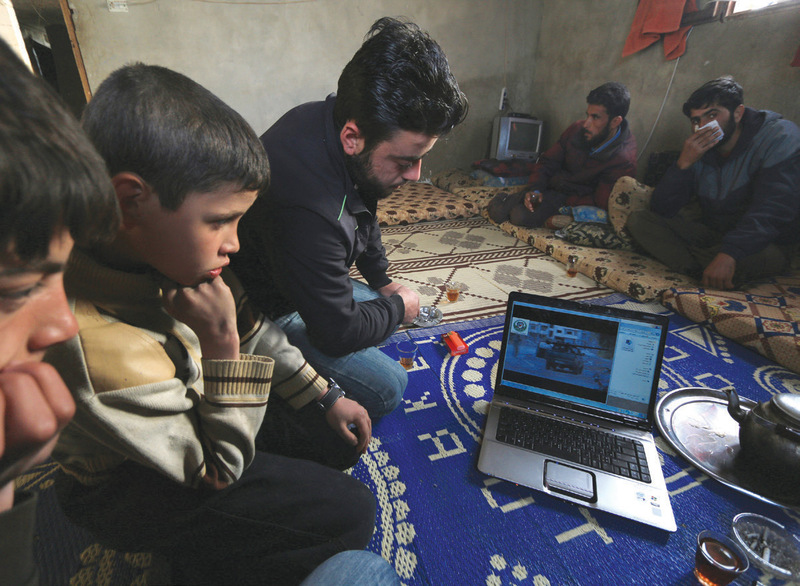 Syria has approximately 25-per-cent internet penetration. A majority of users access pages on social networking site Facebook and visit YouTube, home to hours of footage that documents regime atrocities; a lesser number communicate on Twitter. Yet for all its championing in the early days of challenge to the Assad regime, the internet is an unstable and precarious sphere of influence. Transnational capitalism is shaping the design and usage of most online tools and platforms and this is no less true in Syria. On top of the usual hazards around maintaining anonymity, the regime exerts a strong hold over internet infrastructure. ICT in Syria is literally about accumulated wealth based on inherited power: most of the telecom sector and ICT market is owned or controlled by the Makhloufs – Bashar al-Assad’s mother’s family. With such intimate connections between the regime and the market, the internet can be cut or telephones locked with ease, as we have seen many times in parts of Damascus, Homs and Aleppo. Government opponents face virtual foes such as the pro-Assad Syrian electronic Army, which levels cyber attacks at political opposition and human rights groups. An early optimism about how technology could boost the pro-democracy cause is now waning. While the Syrian revolution is still thriving on the internet, an unequal playing field means that its potential fluctuates. The internet can be used for the cause of freedom and its suppression in equal measure.